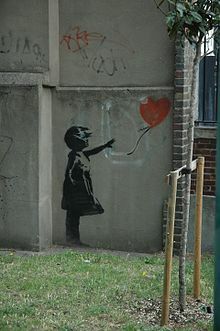 Girl with Balloon (also, Balloon Girl or Girl and Balloon) is a 2002-started London series of stencil murals by the graffiti artist Banksy, depicting a young girl with her hand extended toward a red heart-shaped balloon carried away by the wind. The first work was on Waterloo Bridge, and other murals were around London, though none remain there. Banksy has several times used variants of this design to support social campaigns: in 2005 about the West Bank barrier, in 2014 about the Syrian refugee crisis, and also about the 2017 UK election. A 2017 Samsung poll ranked Girl with Balloon as the United Kingdom's number one favourite artwork. In 2018, a framed copy of the work spontaneously shredded during an auction, by way of a mechanical device Banksy had hidden in the frame. Banksy authenticated he was responsible for the shredding and gave the altered piece a new name, Love Is in the Bin. Sotheby said it was "the first work in history ever created during a live auction." This variation in London, seen above in 2006, was the last one in the city, painted over in 2007. The first mural was in 2002 at the stairs for Waterloo Bridge on the South Bank side. A number of other mural versions were also created in London, though, mostly painted over, none of the works by Banksy are remaining. A 2004 version of the mural was at an east London shop in Shoreditch, sold in 2007 for £37,200 at Sotheby's, and was removed by the Sincura Group in 2014 and sold for £500,000 in September 19 2015. Several sets of limited edition prints of the work were produced, which became valuable over time. An initial set of 25 signed prints was produced in 2003, while a set of 150 signed prints and a set of 600 unsigned prints were produced in 2004/2005. In November 2015, one of the signed set of 150 was auctioned for £56,250, more than twice its estimated value. A 2009 version was sprayed directly onto the cardboard backing of an Ikea frame. In August 2005, Banksy included it as part of a series of murals on the West Bank barrier, a variation called Balloon Debate of the girl floating above the wall while holding onto a bunch of balloons. In March 2014, the third anniversary of the Syria conflict, Banksy reworked the painting to depict a Syrian refugee and added the hashtag #WithSyria. On 13 March, the image was projected on the Eiffel Tower and Nelson's Column. An animated video was released, featuring animation based on Banksy's work, narration by Idris Elba, and music by Elbow. In the following weeks, the singer Justin Bieber got a tattoo based on the original art and posted a picture of it on Instagram before deleting it. Banksy posted this picture on his Facebook page with the comment "Controversial". In July 2017, a Samsung poll of 2,000 people from the United Kingdom asked participants to rank twenty pieces of British art. The poll's results listed Balloon Girl as the people's number one favourite artwork. In early June 2017 before the United Kingdom general election, Banksy introduced a variant of Girl with Balloon with the balloon coloured with the Union Jack design. Banksy initially offered to send a free print of his art to registered voters in certain constituencies who could offer photographic proof they had voted against the Tories. The offer included a disclaimer: "This print is a souvenir piece of campaign material, it is in no way meant to influence the choices of the electorate." Banksy cancelled this offer on 6 June 2017 after the Electoral Commission warned him it could violate election bribery laws and invalidate the election's results in those constituencies. On 5 October 2018, a 2006 framed copy of the artwork was auctioned at Sotheby's selling for £1,042,000 – a record high for the artist. Moments after the closing bid, the artwork began to self-destruct by means of a hidden mechanical paper shredder that Banksy had built into the frame bottom. Only the lower half shredded. Banksy released an image of the shredding on Instagram with the words "Going, going gone..". Sotheby's said "We have not experienced this situation in the past where a painting spontaneously shredded", leading some market watchers to speculate the remains of the painting will be worth even more. Banksy released a video of the shredding and how the shredder was installed into the frame in case the picture ever went up for auction. The woman who won the bidding at the auction decided to go through with the purchase. The partially shredded work has been given a new title, Love Is in the Bin, and was authenticated by Banksy's authentication body Pest Control. Sotheby's released a statement that called it "the first artwork in history to have been created live during an auction." ^ Bull, Martin (2011-11-01). Banksy Locations & Tours Volume 1: A Collection of Graffiti Locations and Photographs in London, England. PM Press. ISBN 9781604863208. ^ "Record price for Banksy bomb art". BBC News. 8 February 2007. Retrieved 17 December 2015. ^ McDermott, Josephine (7 February 2014). "London Banksy Girl and Balloon mural to be removed". BBC News. Retrieved 7 March 2016. ^ "Banksy 'Girl and Balloon' canvas smashes auction estimate". ITV News. Retrieved 2018-10-16. ^ "Bonhams : Banksy (British, born 1975) Girl and Balloon 2003". www.bonhams.com. Retrieved 2018-10-16. ^ "picturesonwalls". www.picturesonwalls.com. Retrieved 2018-10-16. ^ "Banksy Girl With Balloon (2004), Meaning & Description, My Art Broker". My Art Broker. Retrieved 2018-10-16. ^ "Banksy print makes more than a Picasso at auction". ITV News. Retrieved 2018-10-16. ^ "Banksy artworks sell for £400,000". BBC News. 2012-03-30. Retrieved 2018-10-16. ^ "Bonhams : Banksy (b. 1975) Girl and Balloon 2009 signed and inscribed For Mike. Thanks on the reverse stencil spray paint on cardboard, in integral frame 54 by 74 cm. 21 1/4 by 29 1/8 in. This work was executed in 2009". www.bonhams.com. Retrieved 2018-10-16. ^ Grovier, Kelly (2017-12-15). "How a balloon can be an emblem of hope". BBC. Retrieved 2018-10-15. ^ Kim, Adela H. (2014-03-26). "Banksy and the Wall". The Harvard Crimson. Retrieved 2018-10-15. ^ Davis, Ben (2018-10-10). "Can We Just Admit That Banksy's Art-Shredding Stunt Is Actually Really Good?". artnet News. Retrieved 2018-10-15. ^ Jess Denham (12 March 2014). "Banksy reworks girl with heart balloon to mark third anniversary of Syria conflict". The Independent. Retrieved 7 March 2016. ^ "Justin Bieber's Banksy Tattoo Blasted By The Graffiti Artist, Sort Of". The Huffington Post UK. 18 March 2014. Retrieved 7 March 2016. ^ "Banksy's balloon girl chosen as nation's favourite artwork". BBC News. 26 July 2017. Retrieved 29 July 2017. ^ "Banksy risks breaking election law with offer of art prints for anti-Conservative voters". ITV. 3 June 2017. Retrieved 10 June 2017. ^ O'Connor, Roisin (4 June 2017). "Banksy is offering free art to people who vote against the Tories". Independent. Retrieved 10 June 2017. ^ Morris, Steven (6 June 2017). "Banksy forced to withdraw offer to send free artwork to non-Tory voters". The Guardian. Retrieved 10 June 2017. ^ a b Gina Martinez (October 6, 2018). "'It Appears We Just Got Banksy-ed.' Art Piece Self Destructs After Being Sold for Over $1 Million". Time. Yahoo! News. Retrieved October 7, 2018. ^ "Banksy artwork shreds itself after £1m sale at Sotheby's". BBC News. 6 October 2018. Retrieved 6 October 2018. ^ Johnston, Chris (6 October 2018). "Banksy auction prank leaves art world in shreds". The Guardian. ^ Jill Lawless (7 October 2018). "Banksy artwork self-destructs just after $1.4 million sale". Associated Press. Retrieved 8 October 2018. ^ "Banksy publishes video detailing auction stunt plan – video". The Guardian. 7 October 2018. ^ Busby, Mattha (11 October 2018). "Woman who bought shredded Banksy artwork will go through with purchase". The Guardian. ^ Kinsella, Eileen (11 October 2018). "Banksy Authenticates and Renames His Shredded $1.4 Million Painting—Which the Buyer Plans to Keep". artnet. This page was last edited on 19 March 2019, at 11:43 (UTC).